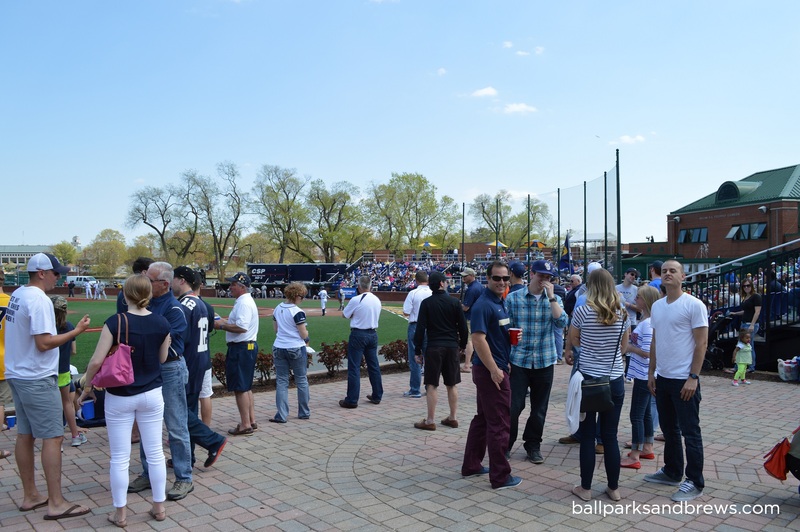 Ballpark Basics: Go Navy, Beat Army! Having members from both of our families being in the Navy we knew that we had to catch a game at the Naval Academy and what better game than the Army-Navy game. Unlike the annual football game that is played at a neutral site, the baseball teams alternate between campuses each year. For a typical game there is plenty of parking outside of the ballpark. However, the Army-Navy game is anything but a typical game. With restricted access to the base the parking options were limited for this game which led to people inventing parking spots anywhere they could, including on a small hill next to the road that left cars in a precarious position. 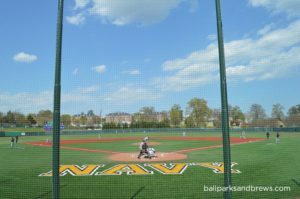 The stadium is named after Max Bishop, the Navy baseball coach from 1937 to 1961. It is a beautiful facility that went through a major renovation in 2005. The outside of the grandstand is wrapped in brick with arched entry ways that lead you into the seating area. Blue seats with seat backs fill in the grandstand with a small walkways that separates the seating bowl into two levels. A large brick building behind home plate houses the press box and the concession area. For this game just about every seat was taken and many people filled out the two additional standing room sections. Along the third base side there is a nice stone patio that sits right behind the Navy dugout and offers possibly the best view of the field. Further down the left field line is another standing room section that is on top of a the teams storage facility. 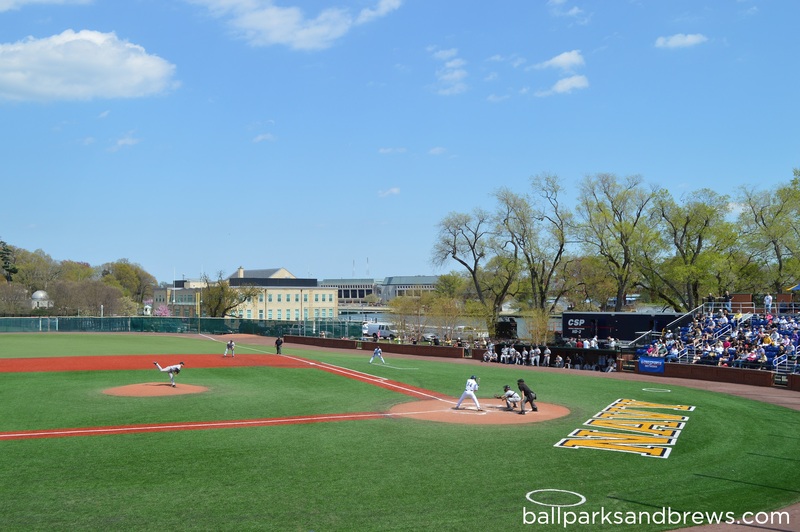 The entire field is covered in FieldTurf (excluding the mound and home plate) making the color pop for an early Spring game where leaves had not yet formed on the trees and the typical grass had not yet turned to its Summer green. 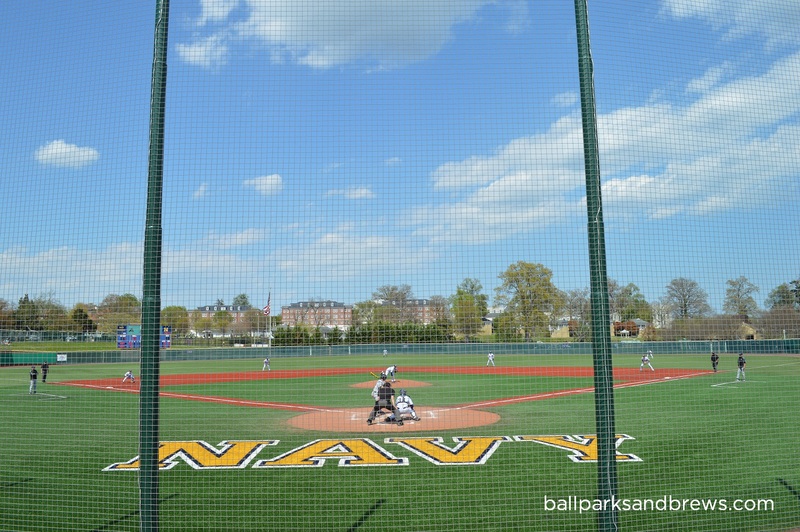 Behind the outfield walls are the Academy’s housing and a Naval fighter jet which is just one more reminder that you are not attending a game at just a typical ballpark. The concessions are your typical fare for a college baseball game (hot dogs, chips, etc.) While there are no alcohol sales in the ballpark many people had brought in coolers with a variety of adult beverages. We were lucky to enjoy a warm early Spring day catching a game between two storied rivals that collectively help protect our nation. Talking to people around the ballpark many lamented that every game was not so well attended. Considering the team that is playing and the ballpark that they play in, we couldn’t agree more. 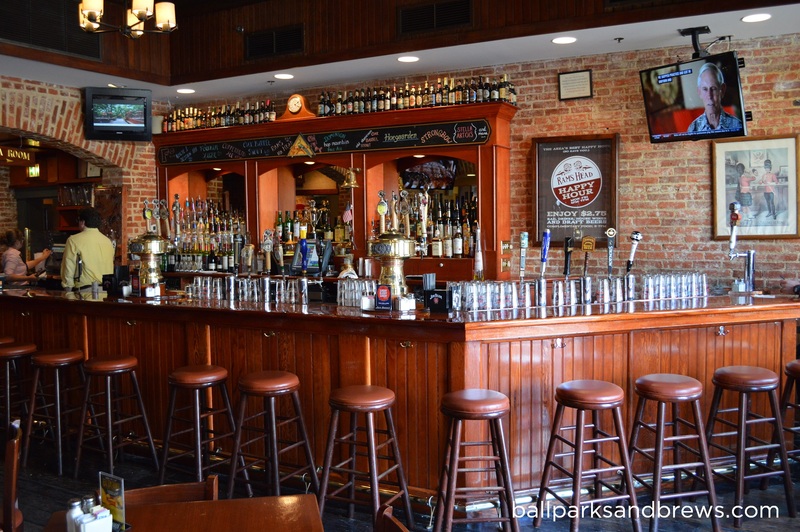 Brew Basics: A popular spot that holds true with the historic aspects of the city it calls home. 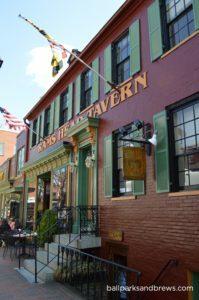 In the heart of downtown Annapolis, the building that is now Rams Head Tavern really is more of a traditional “home” than place of business. The well preserved building gives off a historic vibe even as you’re still across the street. 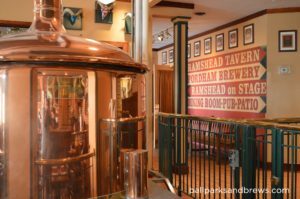 This is the original home of Fordham Brewery, where – according to the owner – in 1703 Queen Anne decided you couldn’t have a successful colony without a brewery. 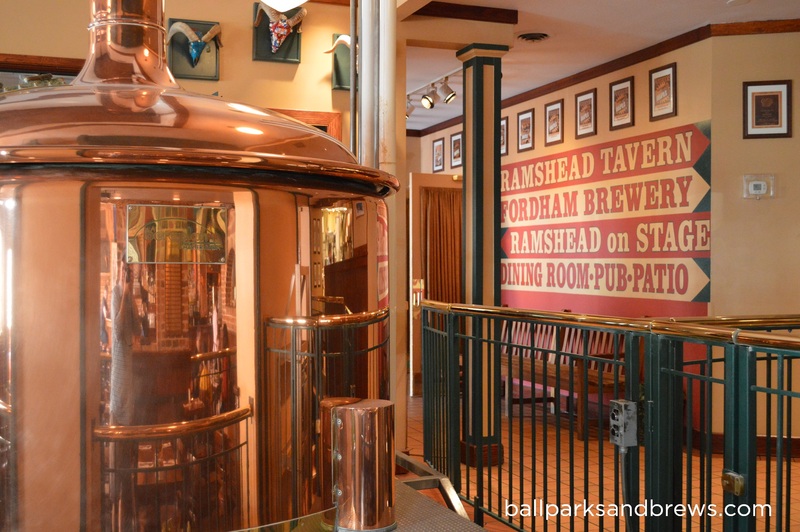 Reestablished in 1995, the new brewery continued Fordham’s long history. The walls are brick, the floor tiled and the sundeck pretty. Wooden tables and copper brew kettles complete the traditional vibe. When the weather suits, you’ll find the back patio packed with brunch patrons as purple wisteria trees drape their flowers on the brick walkways. 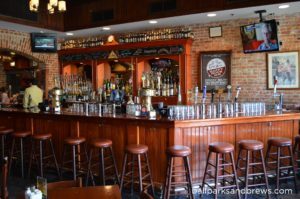 There is even a second area – Rams Head On Stage – that has plenty of area for a band and dance floor, and frequently hosts live music or even the occasional formal event. The place is a favorite stop by patrons near and far, and is also know for their food, so you will frequently find it with a wait – or at least packed. Due to financial reasons, the brewery merged with Dominion and is now brewed about 60 miles down the road. However Rams Head Tavern still stands in its original location, and still proudly serves all of their “home” brews on tap. Wisteria Wheat – Hazy but darker golden which makes this beer look more like an IPA than a wheat. It smells wheaty, and tastes wheaty upfront with a juicy grapefruit/apple finish. Carbonated on front of the tongue and smoother in the swallow, Wisteria Wheat is light, refreshing and good for summer. Gypsy Lager (5.0 ABV/ 19 IBU) – Light honey colored, very light palate with less flavor than the wheat and more carbonation. Very pale, sweet front that’s slightly floral with a honey finish that comes from Vienna Malts. Copperhead Ale (5.0 ABV/ 26 IBU) – Copper colored and lightly carbonated with a medium, almost medium-light body. Ramshead uses a blended Caramunich malt for this beer which imparts a sweetly-roasted malt as the framework for this ale. Rams Head IPA (7.5 ABV/ 75 IBU) – Pours with a traditional IPA color that’s golden-bronze yellow with a long lasting head that stuck around for quite a while. It had a very hoppy aroma and was a thicker drink with a frothy head. It’s a neatly hopped beer where you can taste multiple (Bravo, Chinook, Motueka) hops at different stages throughout, and the one you taste first is not where you end up. Rt 1 Session IPA (4.5 ABV/35 IBU) – This coppery beer has more in common – at least colorwise – with the Copperhead Ale than Rams Head’s signature IPA. It also has a lasting head that coats the glass, and while there are definitely hops in the nose, they’re not as strong as those in the Rams Head either. This is a good, consistent IPA that is more uniform in flavor, having a solid hop backbone without those interesting changes of the previous. Old Dominion Oak Barrel Stout (5.5 ABV/ 28 IBU) An Old Dominion standard and fan favorite. This one has been around for years, but because of their recent merger, Rams Head can count this as one of their own. Coffee color, not much aroma. Dry roasted start, smooth lightly vanilla finish with all around oakiness. Thinner beer with a syrupy coating – not a clean finish.